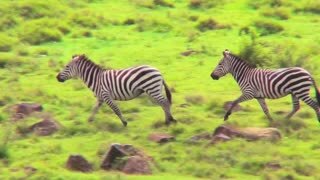 Zebras running in a field in Africa. 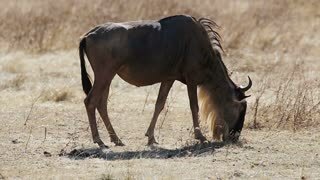 Cheetah feeding wildebeests prey on the grass in Tarangire National Park, Tanzania Africa. 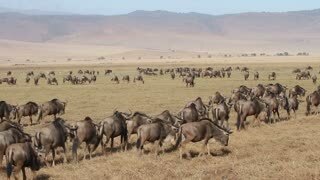 People on safari watch wildebeest cross a river. 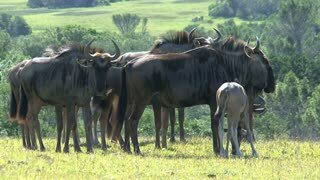 Blue Wildebeest (Connochaetes taurinus) crossing the Mara river during their annual migration, with a startled Giraffe on bank,Serengeti N.P., Tanzania. 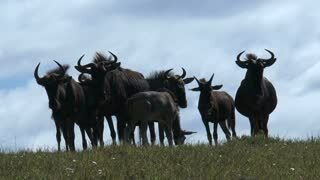 Blue Wildebeest (Connochaetes taurinus) crossing the Mara river in evening backlight, during their annual migration, Serengeti N.P., Tanzania.